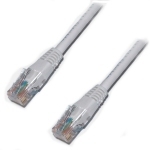 With an excellent build quality, these Ethernet network patch cables have moulded hoods to offer improved stability and reliability. Fully verified for the usual 10/100 Ethernet use AND Gigabit Ethernet, they are ideal for all-round usage from a single patch cable in a home network environment to corporate network patch-bays. Please note that the slimline hoods on these network cables are perfect for the close proximity stacking used on modern switches.